Indian Army Tiruvannamalai Rally July 2017 : Indian Army Tiruvannamalai Rally July 2017 has announced for various roles. want to apply for it? Now here we have updated complete details. Now you can check it below. 2. Soldier Technical Amn - 17 years 06 months to 23 years. 4. Soldier General Duty (GD) - 17 years 06 months to 23 years. 5. Soldier Clerk/ Soldier Store Keeper Technical - 17 years 06 months to 23 years. 6. Soldier Tradesman - 17 years 06 months to 23 years. 2. 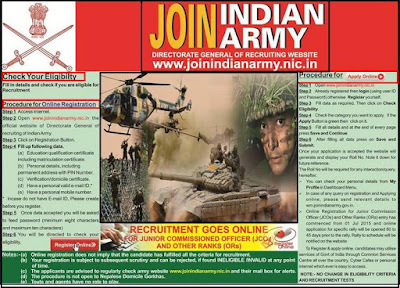 You can register from official site www.joinlndianarmy.nic.in and apply online 04 June 2017 to 03 July 2017. Kindly read instructions for registration and filling application forms on HQ Rtg Zone, Chennai web page of the join Indian army website. 4. Applicant should bring their admit card and application at the rally site. Date of reporting at rally site will be intimated on admit card and thus take the print out of admit card after 03 July 2017 from www.joinindianarmy.nic.jn. (a) SSC Mark Sheet (X). (b) Intermediate Mark Sheet (XII). (d) Nativity, Community, Caste Date of Birth Certificate. Candidates to produce latest automated Nativity, Community and Date of Birth Certificate issued by District Administration of Tamilnadu / UT of Puducherry in English. Residence Certificate holders are not allowed to participate in the rally. (e) Study and Conduct Certificate (Not more than six month old). (f) Character Certificate from Village Sarpanch /Administrative Officer in English. (Not more than six month old). (h) NCC/Sports/ITl & Computer certificate of 0++ level If held. (j) Headmaster/Principal of the school & countersigned by District Education Officer and Mark Sheet of last examination appeared, duly affixed with school seal and attested by Headmaster. Seal and language should be In English. (k) Twelve latest coloured 34mm x 45mm passport size photographs not taken earlier than six months with Name and Date of Birth printed on bottom of photographs of the candidates. The photograph should be without facial hair (Beard) and preferably with light coloured background and plain/light coloured shirt.